Special Order Sale GOING ON NOW! Happy Monday everyone! We hope all of you had as great of a weekend as we did… Pretty weather, gorgeous furniture, great friends… Does it get any better?! 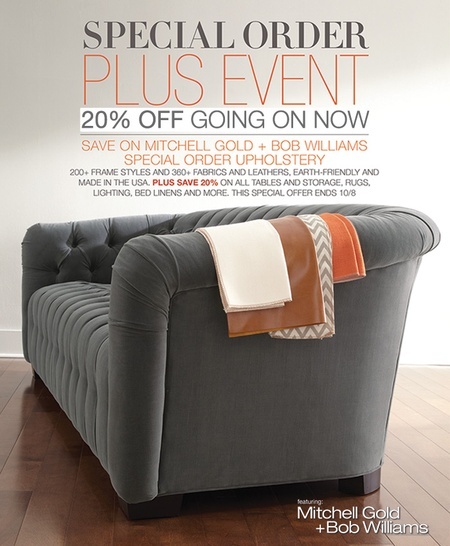 One of the reasons the weekend was filled with so much beautiful furniture is because of the Mitchell Gold + Bob Williams special order sale we have going on right now! If you’ve been eyeing a piece of MGBW upholstery, now is the time to get it on order! Special Order PLUS Event GOING ON NOW! MGBW has tons of fabrics and styles to choose from, and it’s all made in the USA! Pop on in to see what Mitchell Gold goodness we have on the floor to get your creative juices flowing for what pieces would be perfect in YOUR home! Our designers are here to help you make just the perfect choice! This sale is only through the end of the month, so you better hurry in!! On the Sept. 19 post: Could you please tell me the price of the mirror in the first picture…I believe it’s over a small white table. Thank you. Jan– Just following up on this. Did you get an email from Laurel with the price?